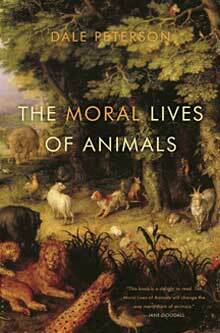 The Moral Lives of Animals began as an argument at a dinner party, where I introduced the idea that animals have morality. I was provoked by the incredulity this idea seemed to cause in the distinguished scholar sitting across the table from me—and persuaded by our dinner host and my friend, philosopher Ajume Wingo, that it was worth writing a book about. Why does your dog automatically chase and, if possible, kill squirrels and other similar animals and yet not—or almost never—chase and try to kill other dogs, even squirrely-looking ones? The large answer to that small question is the subject of this book. The morality of animals is, like the morality of humans, a complex system of inclinations and inhibitions that evolved in response to living in groups, and its function is to mediate the inevitable conflict that arises between self and others. Using evolutionary theory and examples from the scientific studies of a wide variety of animals—from dogs to dolphins, apes to elephants, rats to lizards—I present a new theory of animal morality and explain how and why it applies to human morality as well. This is a popular book for a non-academic audience. Animal lovers and pet owners in particular should enjoy it. At the same time, because it represents a fresh re-examination of evolutionary theory, it ought to be interesting to people interested in evolution and current trends in thinking about the origins of religion and morality. The book was named by Library Journal as Best of the Year for 2011. From The Dr. Decker Weiss Show. Original Air Date December 16, 2013. It is a scientifically accepted fact that humans evolved from a common ancestor with chimpanzees, but our similarities and differences are not what many people think. Animal science expert Dale Peterson, PhD, explores the genetic link between the two species and explains the similarities and differences.